He is suspected of high treason. 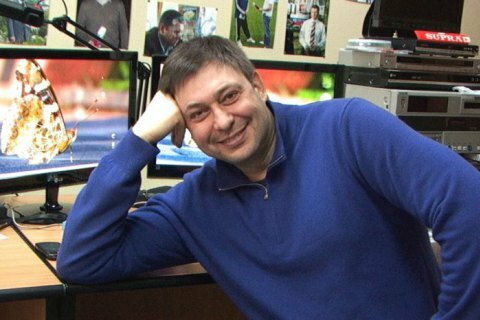 The Kherson city court has remanded the head of the pro-Russian news agency RIA Novosti Ukraine, Kyrylo Vyshynskyy, until 13 July. "A measure of restraint in the form of detention until 13 July 2018 has been chosen," the press secretary of the Ukraine-controlled Crimean prosecutor's office, Tetyana Tykhonchyk, told the Interfax-Ukraine news agency. Article 111 of the Criminal Code of Ukraine (high treason), under which Vyshynskyy is being prosecuted, does not provide an alternative to detention as a measure of restraint. On 15 May, the Security Service of Ukraine (SBU) searched the office of the RIA Novosti Ukraine news agency, part of the Russia Today media group, over its director Kyrylo Vyshynskyy's possible involvement in subversive activities against Ukraine. According to the SBU, in the spring of 2014, Vyshynskyy was instructed to hold a campaign in favour of the Russian annexation of Crimea as a legitimate one. The journalist was decorated with a medal celebrating the "return" of Crimea according to President Vladimir Putin's secret decree.